Kronplatz is one of the great secrets of the South Tyrol. It is the top Italian ski resort for Germans, but remains virtually unknown elsewhere. The dome-shaped mountain, also known as Plan de Corones, is a ski area rather than a single centre. Accommodation is in the nearby town of Bruneck (Brunico) and in a dozen small villages around the mountain base. This resort really is unique in its set up, with all the 100km of local runs starting at the top of just one large dome shaped mountain, and trickling down the hill to the various villages that sit around its base. The plus points are almost too many to mention – an extremely high tech lift system with no less than 19 gondolas, exemplary equipment hire, a truly fantastic ski school and probably the best children’s programme. Absolutely agree with the other 2 reviews. We stayed here 2 years running 5-6 years ago. While time changes I can't see the pluses will have changed that much as all the infrastructure was very new then. We stayed in Reischach/Riscone on the Bruneck/Brunico side. A very comprehensive ski facility purpose built next to the high capacity dual gondola stations - hire shop with locker facilities (no carrying gear! 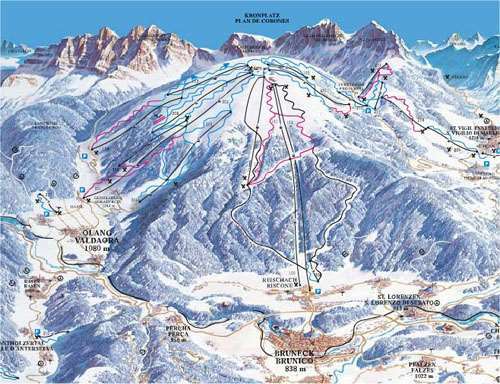 ), ski shops, bar/restaurants, lift pass & ski instruction offices, enormous car park. We went at the start of Easter so as the season is tailing off, only one of the 2 gondolas was needed and then only modest queues existed. Most of the hotels seemed to offer complimentary passes to the 'Kron4' swimming/leisure complex, great for family apr&#232;s ski. I think we went with Neilson, a real shame no British companies seem to offer the resort any more, perhaps as the blurb says it is aimed at the German market and English speaking instructors are limited. A great long 5km black (red at the top section) runs back to the resort and was my son's first ever black run ! There are a few bars/cafes in Riscone, with plenty more in offer down in the valley in Brunico, a short taxi or bus ride away. This is an unbelievable resort in many respects: great for a mixed ability group because everything starts/finishes on the top. It has the most sophisticated lift system in the world (no drags at all) and although we had great natural snow, its snow making capability is second to none. Everywhere you turn there are great huts, and the food is to die for. There's nothing seriously steep, but the 3 blacks (2 down to Riscone/Reisbach and 1 over on Piccolino) merit their grading, and the free bus from Picc gets you to La Villa and from there.... wow! Sella Ronda, Hidden Valley! Fanatstic. When I go again I'll drive and stay in St Vigilio - it's really the only Italian feeling village and it's closer to the rest of the Dolomites, which are all on the same pass.